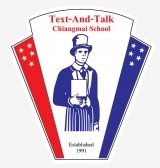 Text-And-Talk Chiang mai School is seeking qualified candidates to fill a variety of positions. Candidates must be native English speakers from Great Britain, the United States, New Zealand, Australia, Canada or Ireland. Positions include: Full-time English Program teachers for a variety of subjects including Math and English for Primary level. Candidates should possess a Bachelor's degree, applicants who along with a degree have teaching certification such as TEFL/TESOL and/or experience are preferred.